Alia Instruments BV, The Netherlands A Dutch-based builder of production monitoring equipment for a variety of industries, serving customers from all over the world. 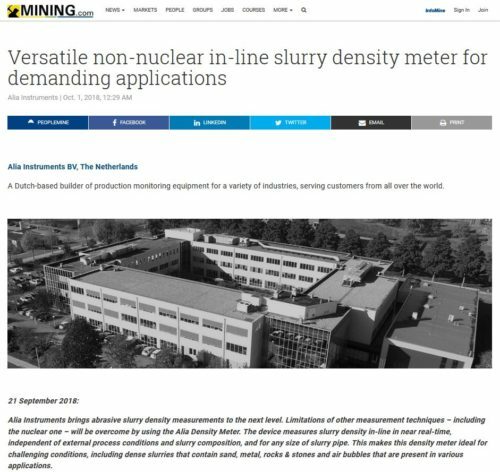 21 September 2018: Alia Instruments brings abrasive slurry density measurements to the next level. Limitations of other measurement techniques – including the nuclear one – will be overcome by using the Alia Density Meter. The device measures slurry density in-line in near real-time, independent of external process conditions and slurry composition, and for any size of slurry pipe. This makes this density meter ideal for challenging conditions, including dense slurries that contain sand, metal, rocks & stones and air bubbles that are present in various applications. The Alia Density Meter uses Newton’s universal second law of motion principle. Inside the in-line device, a force is exerted onto the slurry, its resulting acceleration is measured and the slurry mass is calculated as the ratio of both. Dividing by the known volume inside the meter yields the slurry density. The simple and direct measurement method is nearly immediate (< 5 seconds) and accurate (within 0.5 % of full scale). This is ideal for monitoring density in e.g. tailing and concentrate lines, for quality control purposes to monitor the process consistency over time, or to prevent the pipe from becoming clogged due to ‘too dense’ slurries. The density is measured under dynamic conditions, i.e. when the slurry is flowing, but can also be measured for non-flowing, stationary fluids. Accurate measurement results are obtained regardless of pipe diameter. Internal slurry pipe diameters with metric or imperial sizes typically up to the largest pipe diameters can be dealt with. As Newton’s law applies to everything that is inside the slurry pipe – water, seawater, sand, metal, rocks & stones, large parts, high-density sediment but also air inclusions – the density measurement is independent of slurry composition. 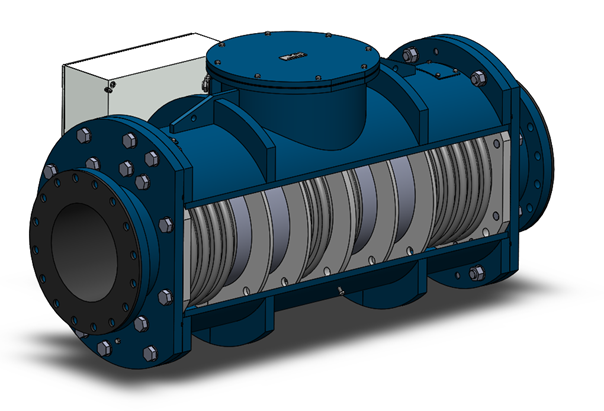 This is specifically an advantage because with other working principles the accuracy is often reduced in large pipe diameters combined with high slurry densities. Furthermore, the Alia Density Meter avoids issues that are related to radioactive technology: no legislation constraints, no transport or dispose of nuclear sources, no special training in nuclear technology for maintenance engineers, and no fear to perform checks and repairs. All improving the sustainable and social responsible image of the density meter’s user. The density calculation is basically unaffected by the surroundings in which the Alia Density Meter is installed, including temperature variations. Horizontal, vertical and tilted installation is possible. External vibrations and disturbances, for example due to other machines or components in a plant, ship of neighborhood, will not interfere with the measurement. These vibrations – if any – are measured and will be compensated for in the mass calculation. Active damping suppresses the influence of external vibrations even more. The easy installation comprises only the mechanical installation of the density meter in the slurry pipe, and electrical installation for connection to the power supply and an external control & read-out device. The density meter can easily be integrated with existing systems and software. A direct control & read-out device is part of the meter. After installation, the meter is virtually maintenance-free. For highly abrasive applications, the rubber tube in the meter that gets in direct contact with the slurry needs to be replaced a few times during the service life of the density meter. In the mining industry, the Alia Density Meter can be used as part of a production meter, where the combination of both flow and density provides valuable data about the efficiency of the mining process. Moreover, with respect to sustainability, the meters have a task as well in slurry streams around dewatering processes in the mining of metals and minerals. The use of this density meter can contribute significantly to saving large amounts of water by providing the operator with an accurate and immediate reading of slurry densities, resulting in an optimal use of often-scarce water. Restez informé avec notre bulletin de nouvelles!